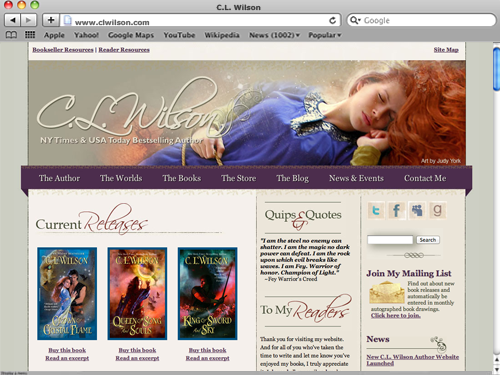 The new website for New York Times bestselling author C.L. 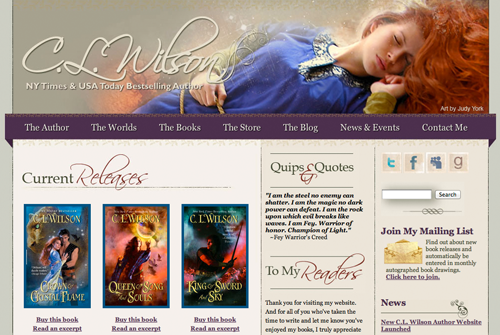 Wilson is built on the WordPress platform with a custom theme developed on my own framework. This website utilizes a custom Events Management plugin, custom post types and the List Category plugin to manage her Accolades, Reviews and Awards information. The News and Events information is handled with an alternate Loop as well. I also migrated her blog into WordPress from Blogger and integrated her social media activity into the website. The site also utilizes a custom skin to the jQuery Vertical Accordion Menu, which uses WordPress menus to organize information, and fifteen dynamic sidebars. This project also included migrating an existing guestbook into the Gwolle Guestbook plugin as well as prepping the backend for a members only section and customized login screen. Also, the site’s MailChimp mailing list syncs with the membership database. Cheryl’s WordPress installation included the standard set of security plugins I offer all of my clients as well as Jetpack for WordPress to handle site traffic statistics.